Head over to Oh My! Handmade Goodness to get this free printable card by Meg of Olliegraphic. Perfect for whenever anyone does a good job at anything. I LOVE these free little pieces of magic you share with all of us--thanks many times over! Ah! So cute! Thanks for sharing. Your card finds are so great! Thanks! 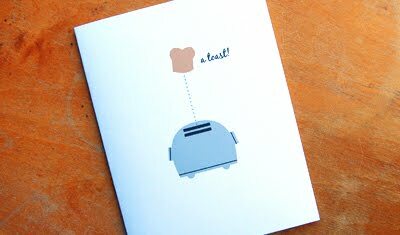 love this :) I have something similar for my company, Toastie Studio. Ack! I can't handle the cuteness! I am so happy this is now MAC compatiable. I would like to try the sketch feature. Although never having used a cutter I could be happy with all it does! I've been drooling over one of these for awhile! I hope hope hope I win. Thank you!!! I'd love to win this, thanks!! Yes please...I am going to be up all night dreaming of the cool things I could make! Like you, I have never really considered buying one of these cutters but they sure look fun!! Thnaks for having this contest! www.atouchofheaven.etsy.com - Mary B.